And they feed, for the love of God, the poor, the orphan ... (saying),"we feed you for the sake of God alone: no reward do we desire from you, nor thanks". "Love all and hate none. Mere talk of peace will avail you naught. Mere talk of God and religion will not take you far. Bring out all the latent powers of your being and reveal the full magnificence of your immortal self. Be overflowing with peace and joy, and scatter them wherever you are and wherever you go. ... Never refuse to bless and help the needy and the poor, the widow, and the orphan, if they come to your door. This is your mission, to serve the people." - from the final discourse of Khwaja Mu'inuddin Chishti to his students, one month before his death. 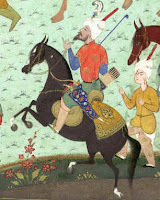 Before Islam appeared, the tradition of chivalry (javanmardi in persian, futuwwaht in arabic) in the Middle East was maintained through the training of men to be chevaliers. The tradition of chivalry involved consideration for others (morowwat), self-sacrifice (ithar), devotion (fada-kari), the helping of the unfortunate and unprotected, kindness towards all created beings, keeping one's word and self-effacement - all qualities that were later to emerge as the noble attributes of the perfect human being from the point of view of Sufism. In addition to these attributes of a true human being, the chevaliers were committed to a particular code of etiquette and conventions, from which the main objective and principles of chivalry or javanmardi were derived. With the appearance of Islam, these chevaliers embraced the religion of Islam while retaining the conventions of chivalry, thereby founding the creed of Sufism on the basis of both Islam and chivalry. Thus, the etiquette of the chevaliers became part of the practice of the khaniqah and of the Sufis. Gradually, as the philosophy of the Unity of Being (wahdato'l-wojud) and divine love were made more profound and appealing by Sufi masters, the tradition of chivalry, hand-in-hand with it, gained an extraordinary influence and currency. The spirit of Sufism consisted of focusing one's gaze in one direction (towards God) through the power of love, and its method was to cultivate a humane code of ethics, which was equated with that of the chevaliers. Sufism, then, has both an outward and an inward aspect: its inward aspect consists of traveling the Path and traversing its stations to attain the level of subsistence-through-God (baqa'). Its outward aspect consists of the tradition of chivalry, which constitutes the development of the attributes of perfect human beings. "The perfect example of this level of control and chivalry is demonstrated by the conduct of Hadrat Ali ibn Abu Talib a companion of the Prophe who once, in the midst of battle was about to slay his opponent. As he raised his sword to strike, his enemy spat in his face. Hadrat Ali immediately dropped his sword, refused to strike and walked away from his enemy in the battlefield, “what is wrong with you, why do you not strike?" the man asked. "Because before you spat at me I was fighting you for the sake of Allah Almighty” Ali replied, "but after you spat I was fighting you because I was angry - and as a muslim I can only fight for Allah , never for my own Nafs." Chivalry (futtuwa) and courtesy (adab) are actually essential parts of the Sufi path. Sufism's inward aspect consists of traveling the Path and the traversing its stations to attain the level of subsistence-through-God (baqa). Its outward aspect consists of the tradition of chivalry which constitutes the development of the attributes of perfect humans. "[It] means opposing and arguing little, being fair; preventing errors in oneself and not criticizing the errors of others; trying to correct one's faults; accepting accusations; enduring troubles caused by others; lowering one's ego; being pleasant to both the old and the young, doing good deeds, giving good advice, and accepting advice; loving one's friends; and bearing peacefully with one's enemies." The classic writing by sufi saint and scholar Ibn Al-Husayn al-Sulami - The Way of Sufi Chivalry, has been used since the tenth century as code of conduct for Chivarly. Here many spiritual masters share their experience of futuwwah. In Arabic, fata literally means a handsome, brave youth. Following the use of the term in the Holy Koran it came to be associated with an ideal, noble person whose hospitality and generosity would enable him to always put others above oneself. According to Sufis, futuwwah is a state of mind that is animated by selflessness, compassion, kindness, and altruism. This behavior was modeled by the Prophet Muhammad and by other friends and lovers of Allah. The word that describes the Sufi brand of chivalry is adab. They see it as "a continuous act of devotion, for it is a method of constant remembrance of God." "Alaa inna awliya-ullahi laa khawfan 'alayhim wa laa hum yahzanoon"
• Be satisfied with little for yourself, and wish much for others. • Instead of seeking the faults of others, look at your own faults. • Respond to cruelty with kindness, and do not punish for error. • Bring joy into the lives of your friends and meet their needs. • Prefer the well-being and comfort of your brothers over your own, and relieve them of their difficulties. • The host should serve everything he has to his brother. Even if he has only a drop of water left, he should serve that. "A friend of God must have affection like the Sun. When the sun rises, it is beneficial to all irrespective of whether they are Muslim, Christian, or Hindu. A friend of God must be generous like a river. We all get water from the river to quench our thirst. It does not discriminate whether we are good or bad or whether we are a relation or a stranger. A friend of God must display the hospitality like the earth. We are raised and cradled in its lap, and yet it is always under our feet."